Force India was actually the first team to launch its 2015 contender, the VJM08 on 21/01/2015. The most eye-catching points on the new car are a brand new livery and the shorter “finger” nose. 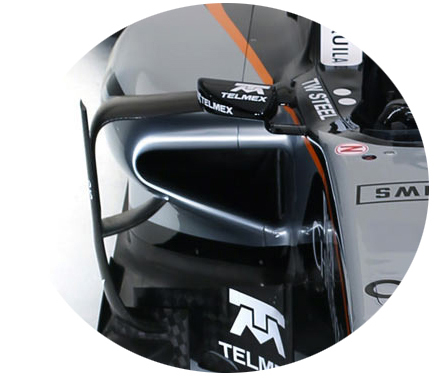 However the car silhouette in general and rest characteristics feature in-depth resemblance to last season’s VJM07. Mercedes continues to power the new chassis for one more season. Without doubt Mercedes proved to be the best engine by far in 2014, not only in terms of top power but also in reliability, torque and even fuel consumption. Starting from livery it is obvious that orange, silver and mainly black dominate on the car, while green and white are now vanished. The new colour combination brings in memory the blacked – orange Arrow cars back in 2000, with silver addition. New sponsorship logos are also visible on the chassis, advertising several new commercial partners. 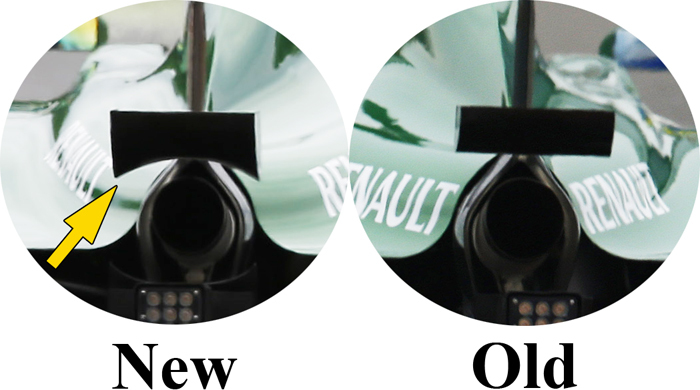 1.Nose: New rules allowed to construct a lower nose cone with shorter and better viewing “finger” tip extension. 2. 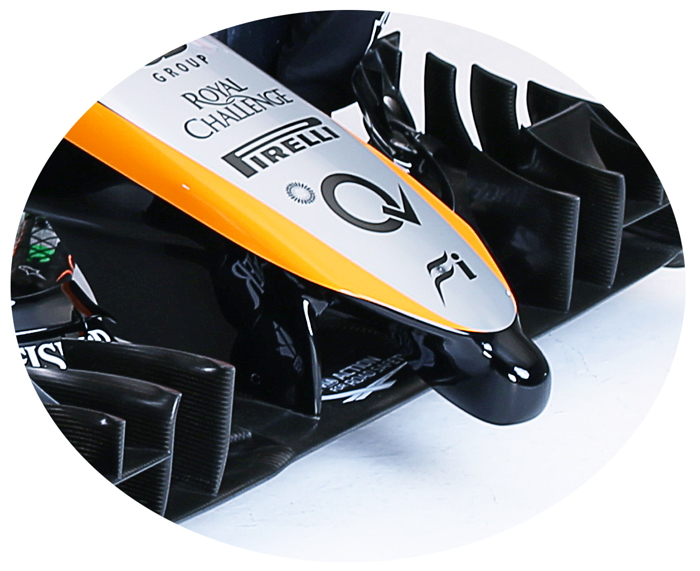 Multi element nose vanes, very similar to late 2014 season version. 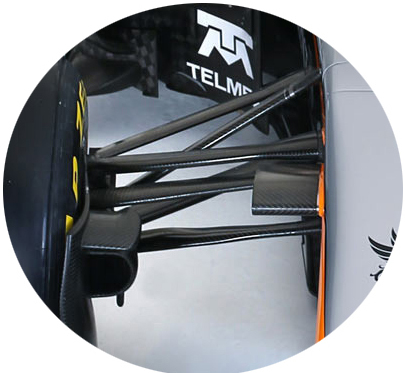 3:The front suspension remains push rod while the steering axis is placed between the up and lower wishbone. Sidepods remain elegant and very sculpted at bottoms. According to team the new car has rearranged internal packaging . Rear suspension remains pull rod and according to the team a hydro-mechanical system replaced the original torsion springs. Force India rushed to launch first its new car in an attempt to attract the lights on. Therefore, judging by what the VJM08 looks like, we jump onto two conclusions, whether it is actually a new car or an “immature” version of it. 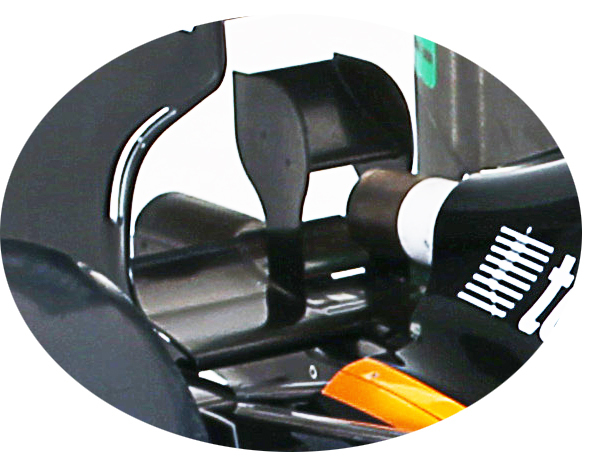 Great resemblance to VJM08 and the appearance of beam wing, an element should be absent since 2014, leaves both possibilities open. In any case the team buys precious time to further develop its 2015 contender, gaining in the same time enough exposure to its commercial partners . One thing is though certain, the car that will compete in season opening race in Melbourne will significantly differ. 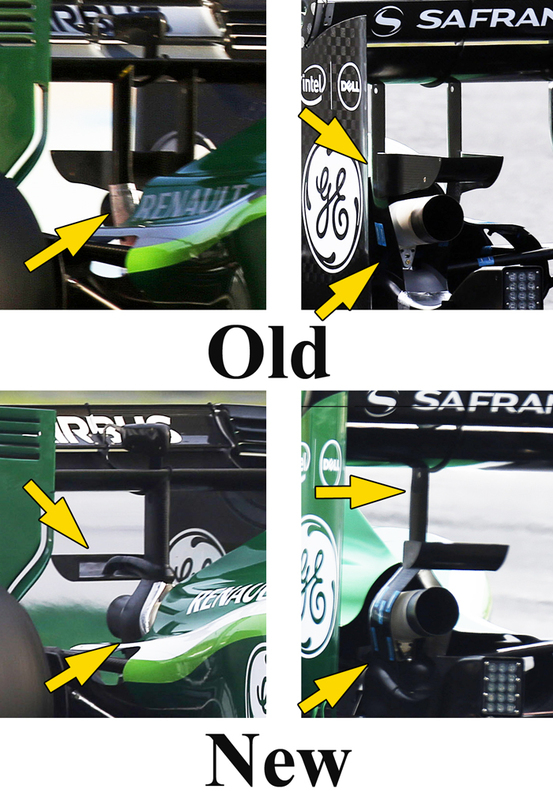 To increase the amount of downforce on the rear axle, Caterham introduced at Spain a redesigned rear mini plane (also called monkey seat) with slopping downwards extremities. 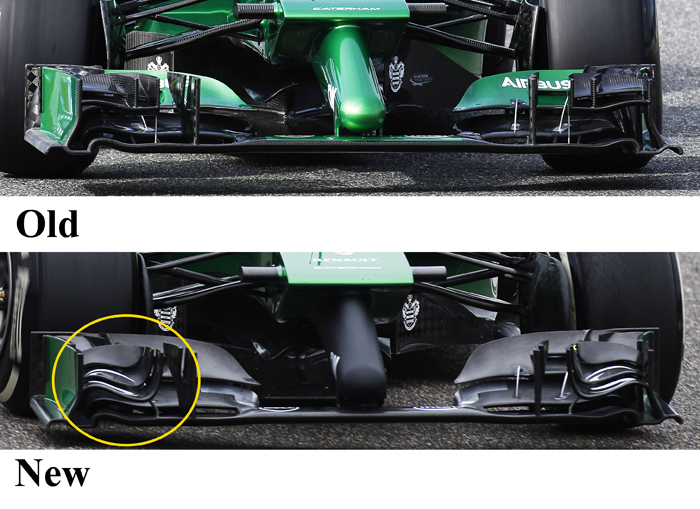 Caterham modified since Melbourne the way rear wing is supported on the car. The new structure involves a single pillar, which splits into two separated elements around the terminal exhaust pipe before both meets the rear crash structure. The old design had instead two thinner pillars starting parallel below the main plane but inclined inwards when dropping down, meeting also the rear crash structure . 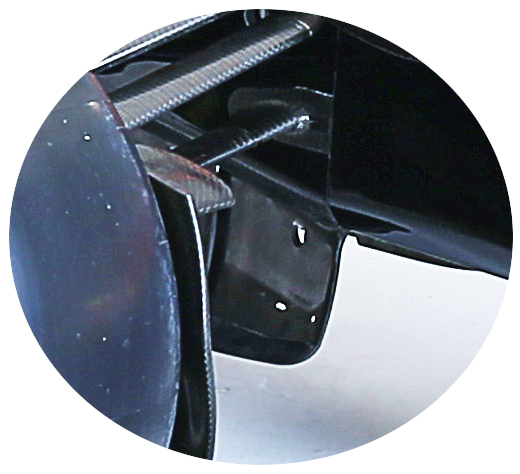 As a side effect the mini plane above the exhaust terminal pipe had to be redesigned and remounted, adopting now a Williams alike support. The transition to the single pillar concept may offer not necessary an aerodynamic advantage over the older design, but another more practical one. The wider single pillar provides a larger internal volume and thus being able to house the connections of DRS to the main car body, thus offering a more direct and shorter route, making it more reliable and compact. Kobayashi adopted since Melbourne a modified front wing, differing on cascade elements.from the previous spec. On the contrary Ericsson retained the old version for all four non European races . However in Spain, Kobayashi paradoxically reversed to the old spec while Ericsson to the new. 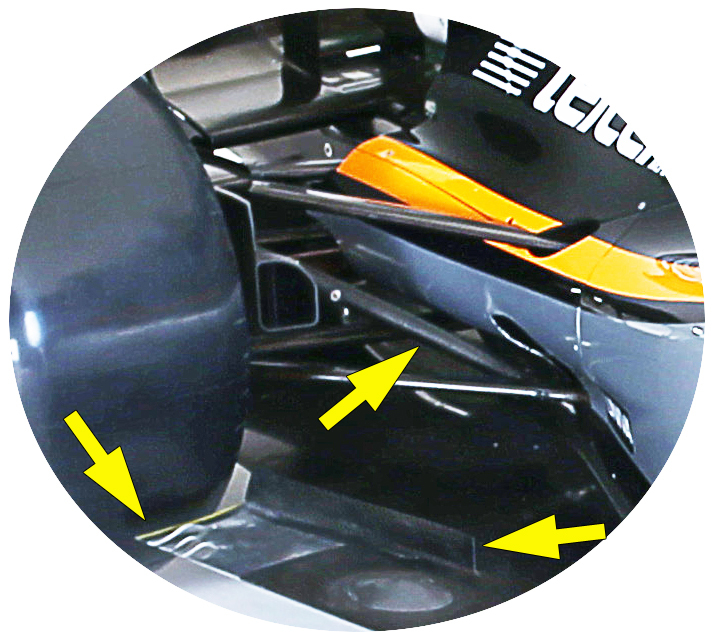 Different front wing set ups for a certain track, is quite common between drivers within the same team, caused mainly by how driving style suits to the car’s characteristic or when racing in mixed (dry/rainy) conditions . Cars with low front grip forces a driver, who likes understeer, to adopt a front wing that generates extra amounts of downforce and vice versa. The car tested in Jerez (pre session test) was stripped of significant aerodynamic elements like sidepod panels and nose vanes because the team focused solely on improving and checking mechanical reliability instead of pushing for the ultimate time. This changed soon after the first test as wide vertical panels attached on sidepods alongside with lateral flow conditioners and skirts added under the nose where the suspension wishbones meet the chassis. Insufficient rear downforce production was noticeable on Sauber and thus team soon pushed to develop new rear wing designs towards downforce increase . 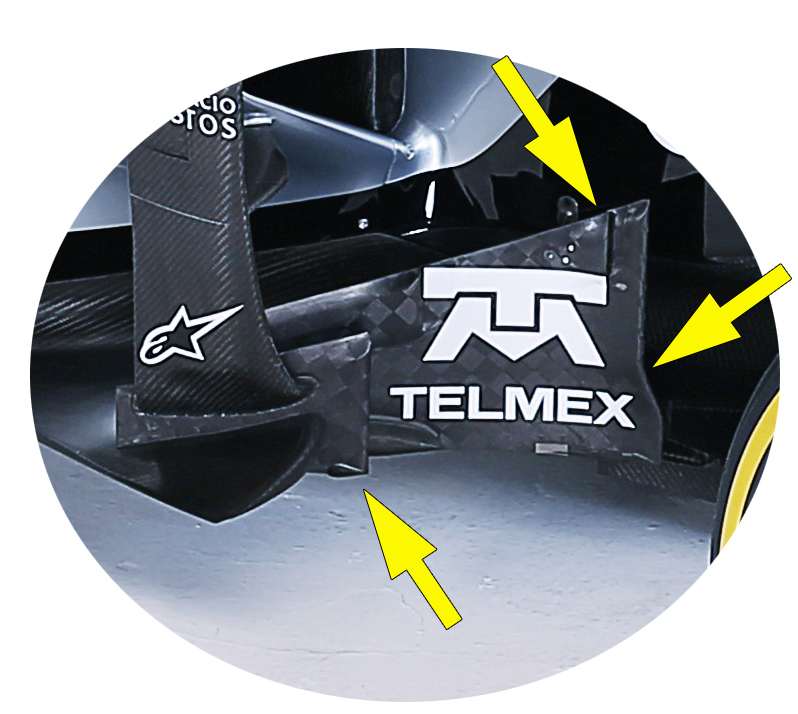 The initial wing version seen in Jerez had two distinctive V cuts on the trailing edge of the movable upper element where the two flap fasteners exist, while the main flap had a slopping downwards profile close to the endplates to benefit as possible from the clean airstream coming unblocked by the main airbox body. 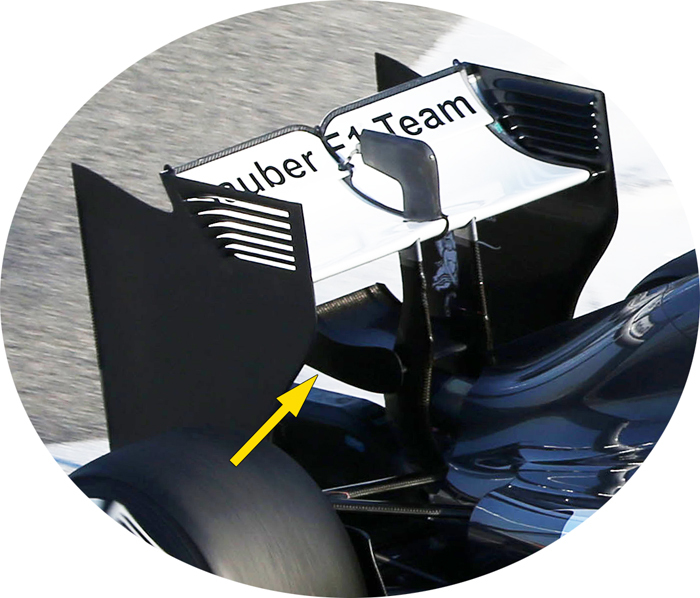 Such main flap design philosophy springs its origin from old Renault team (now renamed Lotus) back in 2006 . 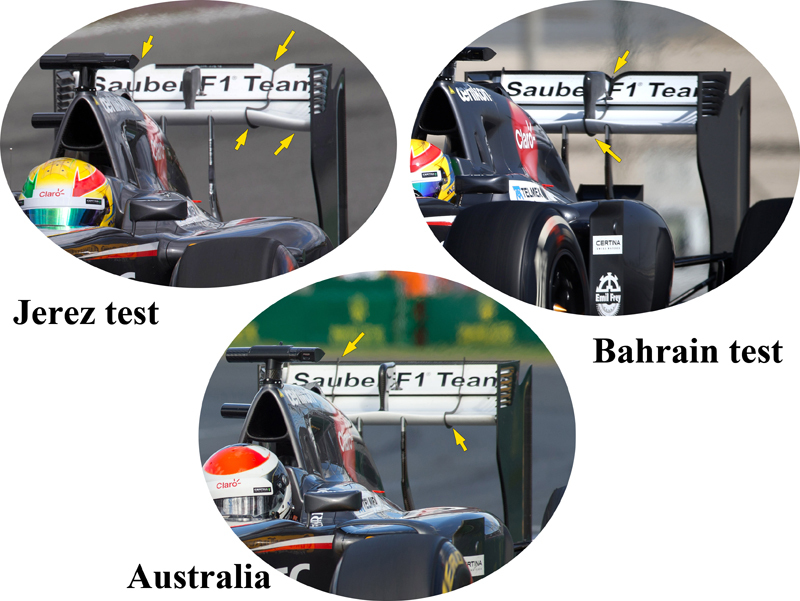 A new version put under test in Bahrain two weeks after which had a wider main flap and three fasteners this time. The upper element was also new because it featured only one V cut in its middle section now. Additionally a mini plane made its appearance above the rear structure. For Melbourne the Bahraini spec modified further, regaining back the two flap fasteners structure design but loosing the V cut. The mini plane also removed . 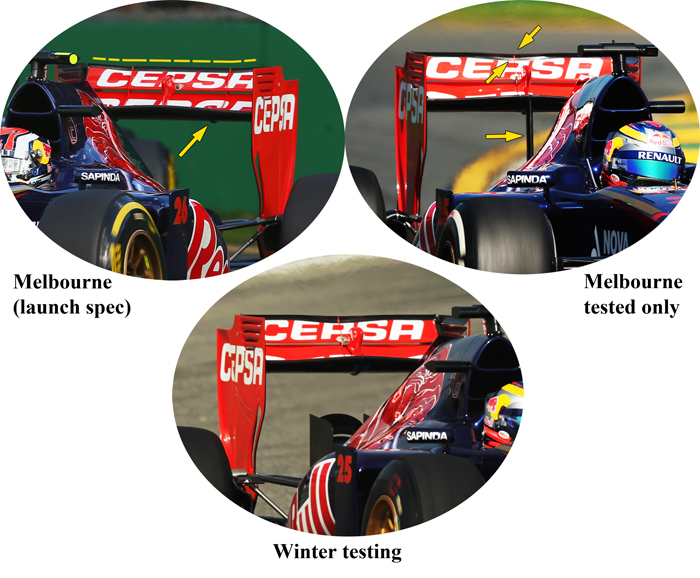 Amazingly ToroRosso tested from launch to the very first 2014 race in Australia three in total rear wing specs, very similar in basic structure but different in details. 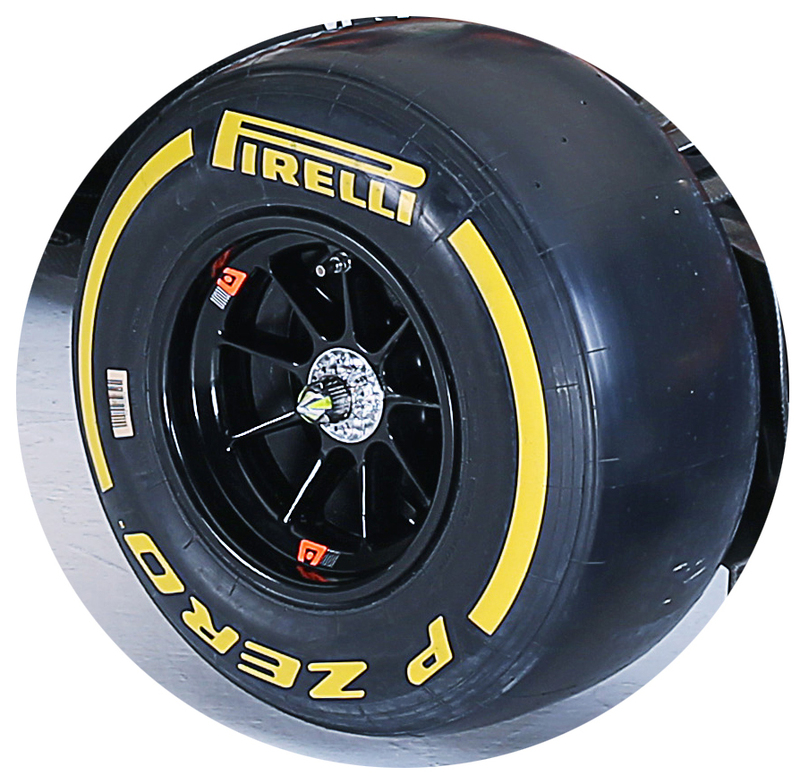 The spec for Melbourne race was similar to the one seen in launch, having two flap fasteners and a curvy upper flap. The team tested during Winter testing one more version with three flap fasteners and reshaped upper flap, an evolution of which having a single pillar briefly equipped on Jean-Eric Vergne car for the Aussie GP free practice sessions.